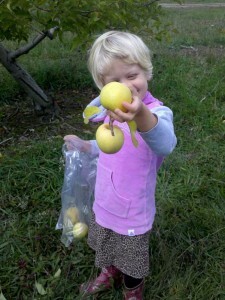 Today I took Nick and Sally to Eddy’s Fruit Farm in Chesterland to pick apples. We met a friend of Nick’s there, as well as his parents and grandmother. I enjoyed meeting them, and it turns out that his Dad and I have some links via my alma mater. In any event, the purpose of the day was apples. As Lyn may have mentioned, the tree fruit crop this year was hurt badly by this spring’s weather. Some U-pick farms don’t have picking at all this year, while others, like Eddy’s, are open for picking fewer days than usual. That said, the picking was great today. The trees were laden with ripe apples. Here and there they were even bunched like grapes down a heavily-bent branch. As usual, the picking on the low branches wasn’t very good near the entrance. There were still some to get up high (I’m over six feet tall, which helps) and, of course, the farthest corner of the orchard is always the least-picked. We started with Golden Delicious. Nick spent some time picking with his friend, while Sally picked with me. She was full of giggles when she picked one apple and had the other one come along for the ride. There was a chilly breeze blowing despite the sunny day, and Sally was cold. Worse, she was missing her nap, so she soon asked to ride in the stroller. 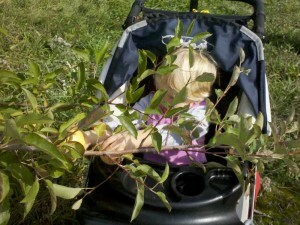 A few minutes later, she asked, “Daddy, can I pick from the stroller?” I found a low-hanging branch and let her try. After she picked two of the four apples on that branch, she was done and ready to nestle under her blanket. 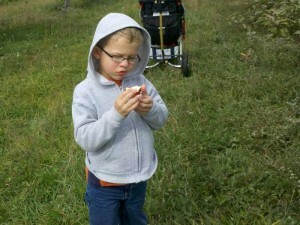 We switched to picking some kind of red apple, and Nick decided to give one a try. It disappeared quickly, so it must be good. 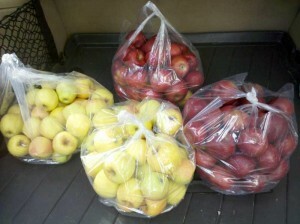 We picked 49 pounds of apples, which comes to about a bushel and a quarter. I was impressed with our haul until Lyn told me it took 21 pounds of apples to can 7 quarts of applesauce. Ah, well, I can pat myself on the back for hauling all 49 pounds to the car while pushing a stroller and conversing with an inquisitive Nick. Yes, there are special skills daddies develop. All in all, it was a good outing. We left a few apples on the trees, but if you go, be sure to call first to check hours and availability.